With BlackBerry KEYone, the company has offered a solid choice for its fans, something that many of its users have happily subscribed to, too. And there’s also a BlackBerry Aurora device, whose users, like the KEYone friends of theirs, are also waiting for BlackBerry to make an official announcement about Oreo. 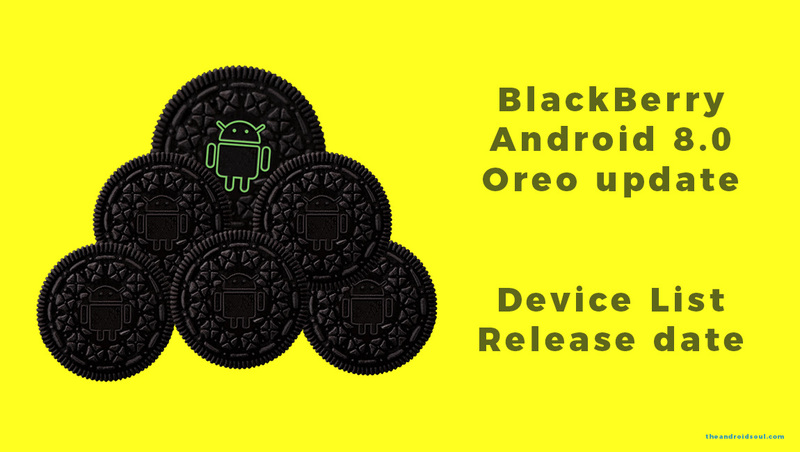 Well, because BlackBerry hasn’t revealed the Oreo roadmap yet, it’s hard to say what release date they are targeting. But because BlackBerry doesn’t have a very good track record with updates, we’re inclined to believe that the BlackBerry Oreo rollout won’t happen that soon, as we secretly wished for. Let’s check out the list of Android 8.0 supported devices of BlackBerry and their expected 8.0 release date. We would not be surprised to see BlackBerry get a place in a list of first three Android OEMs to release the Oreo update. Maybe their use of stock UI helps them, but it’s more so because they care about OS updates. Here is a list of BlackBerry devices that were launched recently, with their Oreo eligibility status and expected release date. We’re sad to report that the PRIV would miss out on the Oreo update unless BlackBerry surprises us, within itself is a wild hope. BlackBerry started beta testing Android Oreo on the KEYone in mid-July 2018 and three months later, the program came to a conclusion. With that said, the Oreo update for BlackBerry KEYone should begin rolling out in late October or early November 2018. The Aurora was launched by BlackBerry with Android 7.0 Nougat OS, and it still runs the exact same version. BlackBerry didn’t think it was necessary to bring the Android 7.1 update — they launched KEYone with this — for Aurora, and that really stinks. But that doesn’t mean BlackBerry won’t update the Aurora to Android 8.0. After all, Nougat to Oreo could be the only major OS update the Aurora uses would get. And it’s okay for OEMs to skip an update in favor of bigger one to avoid working two times on update, while still delivering on the update that mattered the most. Given BlackBerry’s unclear record, though, expect the BlackBerry Aurora Oreo to roll out only in Q4 2018. BlackBerry Motion was announced in late 2017 and comes preinstalled with Android 7.1 Nougat. The company hasn’t said a thing regarding the device’s Oreo status, but considering that it has the same hardware as the KEYone, we expect it to join the party sooner or later, probably before the end of 2018. BlackBerry is still updating the PRIV with crucial security patches, but that’s all you get now. After all, BlackBerry didn’t just forget the Nougat update for PRIV, as they decidedly kept the latest OS on PRIV to Marshmallow, having launched the device on Lollipop when Marshmallow was already out. That’s not cool, yes. But we’re a tad glad that BlackBerry is still pushing out crucial security fixes for the device, even though the PRIV stands no chance of Android 8.0 update. Do you think BlackBerry Oreo rollout could happen this year? First Samsung Galaxy Buds update fixes Bluetooth pairing problems, incorrect battery level indicator and more!